Several activities are planned for the upcoming observance of Easter in Mason County. 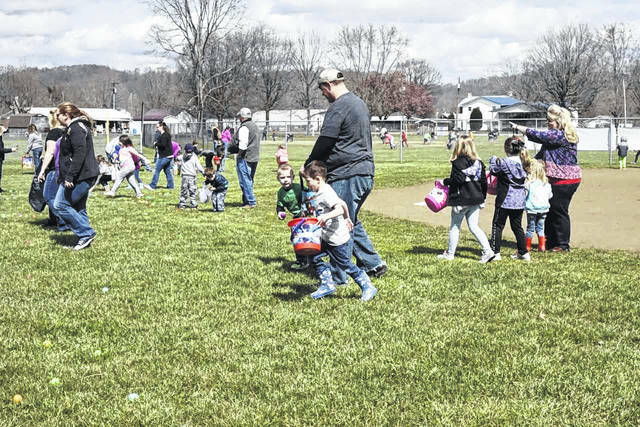 POINT PLEASANT — The annual Easter egg hunt held in Point Pleasant, and sponsored by the Point Pleassant Presbyterian Church, will kick off at 1 p.m. this Saturday, April 13 at Tu-Endie-Wei State Park. There will be grand prize Easter baskets in every age group, as well as other prizes for those who find the specially marked eggs. However, every egg found will have a treat inside. When arriving at the park, areas will be marked for specific age groups to hunt. Those areas are: children ages 1 to 3 years old (this is the only area where adults are permitted to assist children with hunting eggs); 4-5 years old; 6-7 years old; 8-9 years old; 10-12 years old. MASON — For Mason’s Easter egg hunt this Saturday, April 13, there will be a new twist to the event. Instead of finding eggs with slips of paper redeemable for cash prizes, 1,000 one dollar bills will be placed inside the eggs. The remainder of the eggs will contain candy. The change will streamline the process, according to town officials, eliminating the long lines to wait on the prizes. This will allow children attending to immediately take advantage of a free hotdog lunch provided by Maranatha Cornerstone Church. There will be four age groups at the Mason hunt, including 0 to 3 years; 4 to 6 years; 7 to 9 years; and 10 to 12 years. The hunt will be held at the Stewart-Johnson V.F.W./Lottie Jenks Memorial Park at noon. NEW HAVEN — The New Haven Easter egg hunt, also this Saturday, April 13, will see some changes, as well. While prizes such as scooters, stuffed animals and other toys will be given in the younger age group, prize eggs in the older division will contain money, according to Recorder Roberta Hysell. Donations of both prizes and money are still being accepted at the town hall during regular business hours. The New Haven hunt will be held at noon at the ballfields, near the intersection of Midway Drive and Layne Street. Age groups will include 0 to 6 years and 7 to 12 years. LETART — The Letart Community Center annual Easter egg hunt and party will be held at the center at 1 p.m., this Saturday, April 13. The party will follow the hunt with games, crafts, and prizes. Those attending are asked to bring a finger food and drinks to share. Volunteers are needed at 11 a.m. to help hide the 1,400 eggs. The Easter Bunny will make an appearance at all the local hunts. Parents are invited to bring their phones or cameras for pictures. POINT PLEASANT — The annual Mason County Easter Parade, which portrays the life of Jesus Christ from birth to ascension, takes place at 11 a.m. on Saturday, April 13 on Main Street in Point Pleasant. The parade is sponsored by the Mason County Teens for Life group and includes over 30 local churches creating floats and walking, living dramas to portray the life, struggles, death and resurrection of Jesus. In many ways, the parade resembles a passion play. A portion of the parade will contain traditional entries as well. POINT PLEASANT — The Mason County Community Cantata (MCCC) will be telling the story of salvation through various vocal performances and narration on Saturday, April 13 and Sunday, April 14. The program will take place at Main Street Baptist Church and will begin at 7 p.m. with the doors opening at 6 p.m. A nursery will also be available. The program is free of charge, but an offering box will be available for guests at the entrance where the ushers stand. The proceeds of the program will be going to the Mason County Homeless Shelter. POINT PLEASANT — The Miracles of Jesus, an Easter play, will be presented on Sunday, April 14, 6 p.m. at the Point of Faith Church which is located on Route 2 across from Roosevelt Elementary school. The play is under the direction of Rhonda Peck. Pastor Mark Mayes welcomes all to attend.